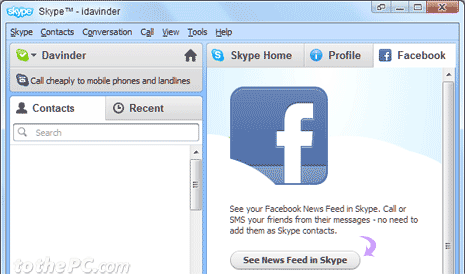 Latest version of Skype software comes with Facebook integration. You can easily view feed of your Facebook account within Skype interface. You can track latest Facebook updates and even post new update to Facebook profile from Skype. You can enable Facebook feature in Skype to view Facebook profile feed. Alternatively, you can disable this feature and remove Facebook feed from Skype. 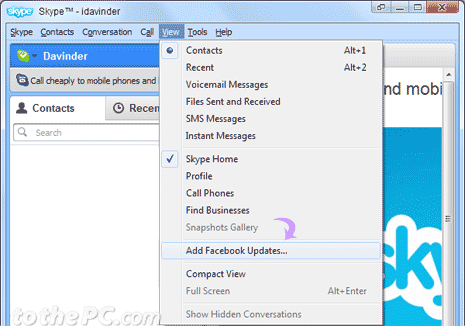 UPDATE (Oct 26, 2012) For users with latest Skype (version 6.0 and above), there is even neater way to remove Facebook updates from Skype. Click on Gear icon at top right and click “Disconnect from Facebook” option. 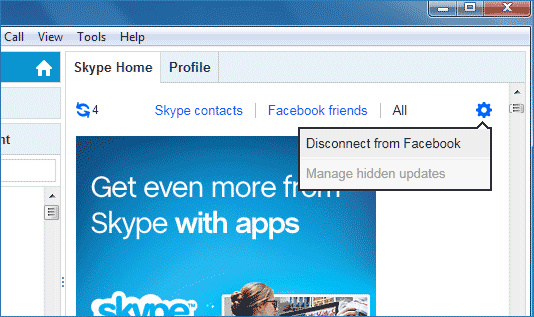 This will disable Facebook in Skype program on your computer, you can easily enable Facebook updates anytime by clicking “Connect with Facebook” option. 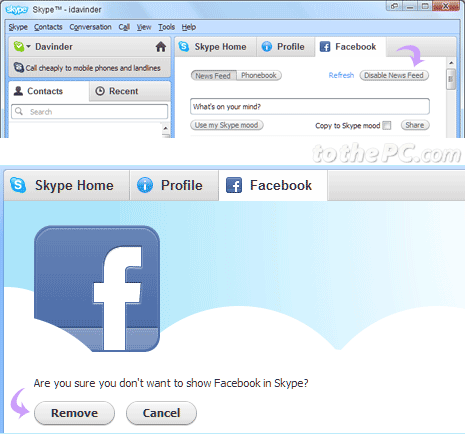 New Skype also feature option to login Skype with Facebook account, checkout! 1. Launch Skype and login into your account. Check for Skype updates to make sure you are using latest Skype version. 2. Click on Facebook tab. If you do not see Facebook tab, goto View > Add Facebook updates menu option to make Facebook tab visible. 3. Then click ‘See News Feed in Skype’ button and enter your Facebook login details. Your latest Facebook updates will be visible within Skype interface. 1. Click Facebook tab in Skype application interface. 2. Then click ‘Disable News Feed’ button at top right. 3. At prompt ‘Are you sure you don’t want to show Facebook in Skype?’, click Remove button. This will remove (or delete / hide) Facebook feed display from Skype application. This was very helpful. I hate how everything is trying to incorporate social networking these days.